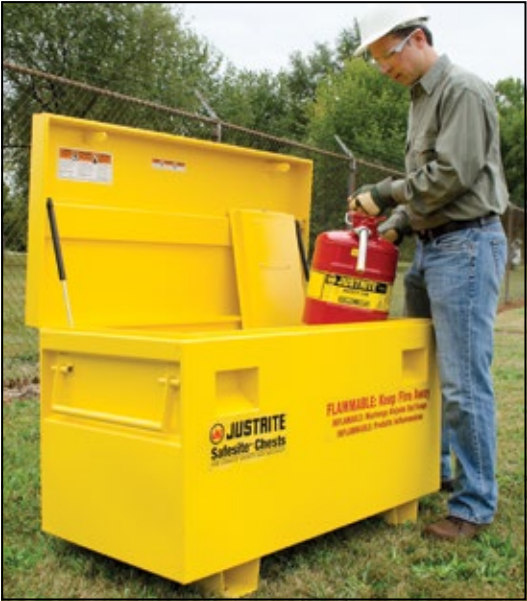 Protect flammables from ignition sources, misuse or theft by storing them in a specially designed Safety Chest. It provides protected storage of fuels, paint thinners, solvents, or other flammables typically found at construction and utility jobsites. Top quality features include heavy-duty, 16-gauge welded steel body finished in a tough UV-protected powdercoat paint that stands up to abusive conditions. Fire resistant 16-gauge steel safety compartment liner with 18-gauge lid provides double walled protection—accepts 5-gallon (19-L) Justrite safety cans. Designed with dual security, Safesite provides superior protection from unauthorized access. Dual security—outside lid offers padlock security while inside compartment features U-Loc technology.